Relampago IX - We are sad to anounce the passing of Relampago IX in 2018; However, his legacy continues on with his bloodlines here at the ranch. 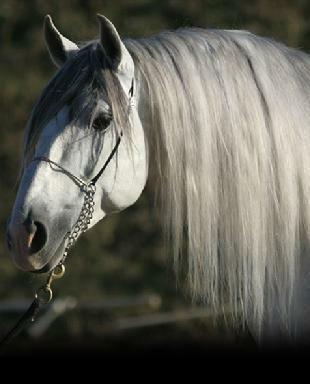 A Multi National Champion PRE Stallion Heterozygous grey, with numerous coloured offspring. He is the Quintessential Spanish horse with the movement to satisfy the most discriminating Dressage rider. He was imported from Spain and has been revised as approved breeding stock with the Jefatura de Cria Caballar (Spanish Stud book managed by LG-ANCCE). Relampago is the premiere breeding stallion at Rancho Armendariz. He is the father of multiple Champions, including the Champion of Champions stallion Distinguido ARM.